1) Not getting paged or called into work overnight. On Tuesday night I got three calls from work after I’d already gone to sleep. Fortunately I didn’t have to get up and drive in to work, but those calls made me lose two precious hours of sleep. I was so annoyed. Luckily my cell phone and pager were quiet last night. 2) Morning radio. Let’s face it – morning commutes are boring. I rely on my favorite morning radio show, Mark and Kristin on KOST 103.5, to keep me entertained for the half hour it takes me to get to work. Especially the celebrity gossip and movie reviews! It’s not intellectually stimulating, but I enjoy it. 3) My pedometer. In the first ten days of Boeing on the Move I’ve become addicted to the clicking sound my pedometer makes when I walk. So far I haven’t fallen short of my 10,000 step goal on any particular day, even when I don’t go to the gym. Walking to lunch and to the grocery store after work really helps. 4) Feeling needed at work. Earlier this week my early shift at work was very quiet and I was frustrated that I wasn’t being more useful to my co-workers. But as soon as I logged onto my computer this morning I had several tasks that needed my attention. It certainly made the day go by faster! 5) Subway. I didn’t get to eat lunch until 3 PM today when I left work and walked over to Subway and inhaled a sandwich. I’m not a big fan of Subway, but I was so hungry that I think anything would have tasted good. The only reason I didn’t go to Del Taco was an attempt to keep up my healthy eating habits, although a cheese quesadilla sounds really good right now. 6) No laundry or dirty dishes. It’s an wonderful feeling to get home from work and not have any dirty clothes or dishes waiting for me. And since we had salads for dinner tonight I didn’t have to do much cooking or food preparation either. It was actually a relatively lazy afternoon and evening for me, but I still didn’t get a chance to watch the “Return to Cranford” disc I got from Netflix. Maybe tomorrow. 7) Hallmark Channel. Episodes of “Little House on the Prairie,” “Fraiser,” and “Golden Girls” in the afternoon. Need I say more? In college one of my roommates and I used to watch episodes of “Full House” to unwind after a difficult day. Now I just have to turn on Hallmark Channel when I get home from work to get the same effect. 8) Long weekends. I was hoping to take tomorrow off from work, but that’s not an option anymore. If I’m lucky I’ll be able to leave at lunchtime. Having Monday off is going to be great, though. I have big plans for reading, movie watching, and relaxing in general. And maybe some exercise too. I need to get my 10,000 steps per day! 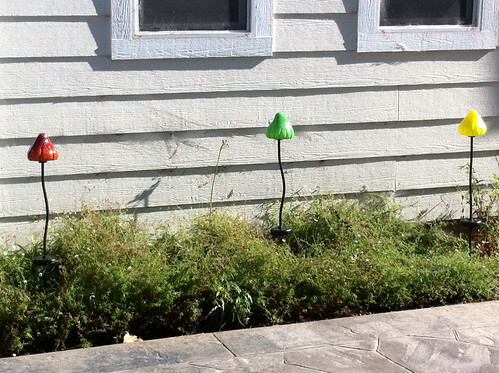 A couple of mushroom lights in the yard next door. Last Friday when Dan and I got back from our ballroom dance lesson we discovered that our neighbor had surrounded his house with these colorful, exceedingly tacky mushroom lights. Dan said Mario and Luigi must have moved in. 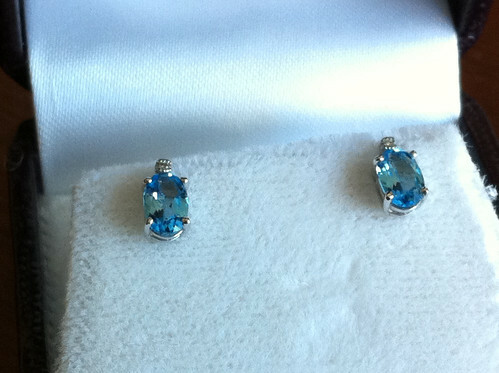 Blue topaz earrings Dan gave me for our anniversary. Evidently blue topaz is the stone associated with the fourth wedding anniversary so Dan gave me this beautiful pair of earrings last Thursday. I’ve worn them every day since then! I promised myself that I was going to bed earlier tonight so that I’ll be marginally more prepared for my alarm to go off at 5 AM. This morning it was waking me up to go directly to work, but tomorrow morning it will be my cue to get ready to go to the gym. Neither one is a very kind awakening, though. Today was a very busy, but very good day at work. I didn’t go to the gym, but I still managed to walk more than 14,000 steps during my regular day, which exceeded my 10,000 steps/day goal. Never underestimate how much you walk around your house! My back is killing me from standing in the kitchen for hours cooking and washing dishes, though. I made spaghetti for dinner and then some red velvet sandwich cookies to take to work tomorrow. I think I managed to get every dish in the kitchen dirty which cooking. It’s a gift, I guess. Now it’s time for me to go to bed. Forgive me for being such a horrible blogger this week. I have several topics that I want to write about, but I can’t seem to find the time! Good thing tomorrow is Wordless Wednesday – it gives me an excuse to be brief! It’s after 10 PM and I should have been in bed an hour ago (especially if I want to read at all before falling asleep). I slept in a little this morning, but I have to be at work very early tomorrow morning. This week is not starting out well sleep-wise. I’m tired and it’s only Monday! I didn’t get home from spinning class until 7 PM then I managed to spend the next three hours making dinner, washing dishes, and walking to the grocery store to increase my daily step count. Work was so busy today that I spent almost all of it at my desk so my pedometer displayed a meager number of steps when I left to go to the gym. Fortunately spinning class is more than 10,000 steps by itself. I didn’t get nearly enough done around the house this evening, but if I go to work early tomorrow I’ll be able to come home early as well. It will be nice to have a few hours to make a decent dinner for Dan and me without feeling stressed. Tonight was salads (with pears, blueberries, carrots, bell pepper, pine nuts, and fresh mozzarella) because I just didn’t have enough time to cook anything. If I can make it to Target to buy some whole wheat pasta I think we’ll have spaghetti tomorrow night. I’m getting hungry just thinking about it (my salad wasn’t all that filling). But right now I need to get in bed as soon as possible. Good night! I’ll pick up right after I unceremoniously published yesterday’s post. The Mexican restaurant where Dan and I were having dinner was pretty close to the movie theater so we decided to just walk over there. About fifteen minutes later we were in our seats with a large Coke and a container of Dibs ice cream snacks. “X-Men: First Class” was released several weeks ago so I was hoping the theater would be fairly empty for the late-night showing yesterday, but more of a crowd showed up than I was expecting. It was not the best movie-going experience due to a few rude patrons, but I thought the movie was great. I wasn’t expecting much, considering the bad reviews I read when it came out, but I really enjoyed “X-Men: First Class.” When it was over Dan said something like, “That was the best X-Men movie yet!” I’m not sure I’d go that far, but I thought it was really good. (Although, my love for James McAvoy might have made me a little bit biased.) I liked the cameos by Hugh Jackman and Rebecca Romijn as well. After the movie we walked back to our car and drove home. Our midnight snack consisted of polishing off the box of French macaroons (not the coconut variety) I ordered from Sucré Bakery in New Orleans for our anniversary. I saw a picture of their macaroons on one of my favorite food blogs and I ordered some for Dan and me immediately. They were absolutely delicious and I would highly recommend them if you’re looking for a completely different dessert option. I went to bed way too late last night and by the time I woke up Dan had already left on his bike to go riding with Dave S. I spent three wonderful hours at home (still in my pajamas) doing chores, reading, and generally lazing about before I finally mustered the energy to go to the gym. I wasn’t looking forward to it, considering how difficult last week’s workout was, but how else was I going to meet my 10,000 step goal today? Luckily, I felt MUCH better this week and I didn’t think I was going to die while working out at the same or greater speeds and resistance on the elliptical and stationary bike. I think I’m actually getting back in shape! When I got home from the gym (after showering, of course), Dan and I dined on some frozen pizza (I’m so lazy) and watched new episodes of two of our favorite summer television shows – “Whale Wars” and “Ice Road Truckers.” Right now we’re sitting on the couch trying to plan a little more of our trip to Maui in November. So far we have the plane tickets to and from Los Angeles, two nights at the Grand Wailea Resort, and our rental car booked, but that’s about it. We still have a lot of hotel rooms and tours to book. Even though we’ll be there in the off season it wouldn’t be a good idea to fly to Hawaii without at least having a place to stay each night. I’m really looking forward to this trip – November can’t get here fast enough! It’s time for me to start getting ready for bed now so I’ll be well rested to start another week of work. I hope everyone had a good weekend! I’m writing this post from Cozymel’s Mexican restaurant because I don’t think I’m going to have another chance to write before midnight. Dan and I are going to see “X-Men: First Class” at 10:10 pm and I’m sure we’ll get home late. So far today we took an almost five hour walk to the Manhattan Beach pier and back (25,000+ steps on my pedometer) and then took a nap afterwards. Not a busy day, but an enjoyable one. Our food just arrived so I’m going to start eating. Then off the see X-Men. I can’t wait! My cookie version of our wedding cake for our fourth anniversary turned out so well that I wanted to share the recipe here. I got the idea from this recipe for chocolate crinkle cookies using a boxed Devil’s Food cake mix. 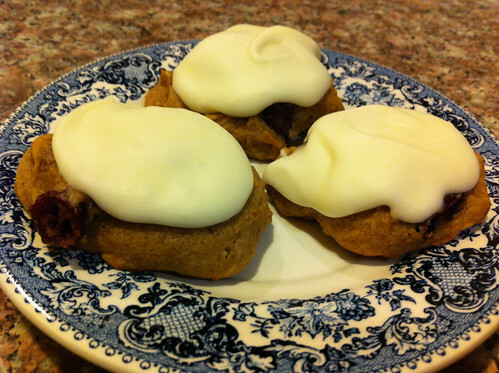 I figured that I could substitute a boxed spice cake mix and make a couple of other changes to create cookies that tasted a lot like the cake at our wedding. It was a gamble, but they are delicious! The batter is very sticky and hard to work with so the cookies came out a little misshapen, but you can hardly tell when they’re topped with homemade orange cream cheese frosting. Actually, I should have made buttercream frosting to make them more like our original wedding cake, but cream cheese frosting is so much better! I would highly recommend this recipe, no matter what kind of cake mix you use. In fact, I have a red velvet cake mix in my cabinet right now. Maybe I’ll whip up another batch of cookies this weekend! In a medium bowl, combine the cake mix, eggs, oil, and orange extract. Stir until combined. Add orange zest and dried cranberries and stir until combined. The batter will be very sticky. Drop tablespoon-sized balls of dough onto a cookie sheet lined with a silpat (that’s what I used) or aluminum foil coated with cooking spray. The cookies will spread a little so make sure they aren’t too close together. Bake at 375 deg F for 9 minutes. 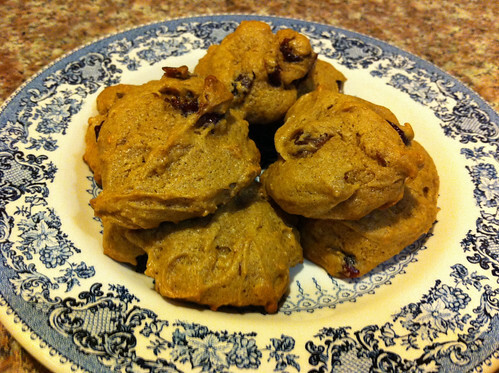 Allow cookies to cool for 5 minutes on the pan before removing to a wire rack to cool completely. When they are cool, top with either cream cheese frosting (like I did) or buttercream frosting (which woud have been more like our original wedding cake). Enjoy! Based on My Baking Addiction’s Easy Chocolate Crinkle Cookies recipe. Don’t worry, I’m not planning to write about my pedometer every day of Boeing on the Move, but I couldn’t think of a better title for today’s post. I didn’t go to the gym today so I had to rely on walking alone to reach my goal of 10,000 steps. I remembered to bring my leftover pumpkin soup with me for lunch so instead of walking somewhere to buy food at noon, I walked to the nearby gas station to buy a diet soda. It would have been cheaper to get a soda from one of the machines in my work area, but it was well worth the extra 50 cents to add 3000 steps to my daily total. Then when I got home after work I parked my car in front of the house and walked over to Target to get some whole wheat pasta for dinner. By the time I got back home my accumulated step count for the day was over 10,000 so I was very happy. Right now my pedometer says I’ve taken 11,832 steps and the day isn’t even over. I have learned not to underestimate how many steps I take while making dinner and doing chores! Dan and I have been eating much healthier lately, but I get tired of salads when we have them for dinner too often. So tonight I made some whole wheat spaghetti with brown butter sauce (including shallots, garlic, sage, and Parmesan cheese). It’s really delicious. Unfortunately I was trying to do too many things at once and accidentally dumped the entire box of pasta on the kitchen floor. I just stood there and stared at the mess for a few seconds, pondering the depths of my clumsiness, before I started cleaning it up. I was able to salvage enough spaghetti for tonight’s dinner, but the rest was a total loss. It went straight into the trash. Luckily it only cost about a dollar, but I hate being wasteful. I was hoping to make some tomato sauce for another meal this week, but I’ll have to go back to Target and buy another box of spaghetti to make it a complete meal. Dan hasn’t gotten home from work yet, but it’s almost 9 PM so I need to start getting ready for bed. I’m planning to go to spinning class at 6 AM tomorrow morning so I have to lay out my workout clothes and back my gym bag before I go to sleep. I’m dying to know how many steps an hour of spinning equates to, but the Boeing on the Move website crashed today so I wasn’t able to find out. I guess I’ll keep trying to reach my 10,000 step count goal without relying on my pinning class. I’m doing well so far, but it’s only day two. Day three here I come!